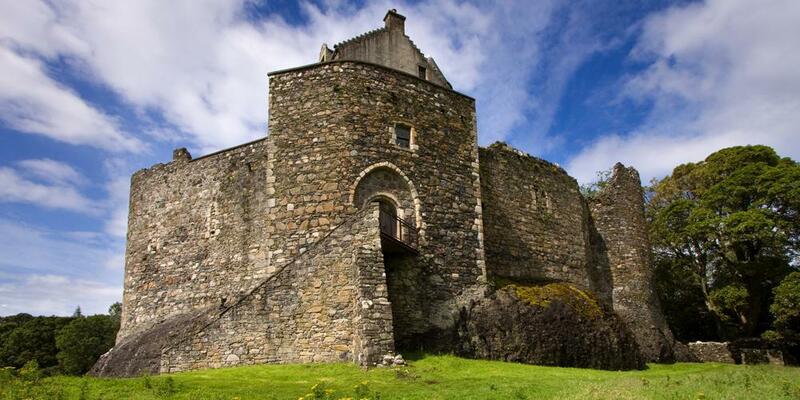 Dunstaffnage Castle is located close to the coastal town of Oban and no far from my birthplace Connel. In the middle of the two stands Dunstaffnage Castle, more than 13 hundred years old and was visited by Robert the Bruce and King James IV amongst others including myself many times. Flora MacDonald was imprisoned in this castle for helping Bonnie Prince Charlie escape Scotland after the Battle of Culloden. On an immense rock overlooking the Firth of Lorn, one of the oldest stone castles in Scotland and the former stronghold of the MacDougalls. Built around 1220 by Duncan MacDougall, the son of Earl Somerled, known also as the ‘King of the Isles’, Dunstaffnage was built at the height of the battle between Scotland and Norway for control of the Hebrides and was besieged by Robert the Bruce during the Wars of Independence. Inside the courtyard are the remains of the great hall and the ‘new house.’ These 18th century residential apartments are where Flora MacDonald is believed to have been held prisoner after helping Bonnie Prince Charlie evade capture by the Redcoats following his defeat at Culloden in 1746. It is said that a lady dressed in green roams the castle’s ramparts. Dunstaffnage Castle owners, Clan Campbell (that’s another story, see below), are said to know whether good or bad fortune is coming their way based on sightings of the lady in Green. If she is smiling good fortune is on its’ way, however if she is crying the Clan know that trouble lies ahead. Aye, the dreaded Campbells, their chief, the Duke of Argyll, has to sleep/stay at the castle one night a year to retain his control over it, however the locals tell me he makes a big entrance on the said night, stays until approx. 1am then flies home to Inveraray, dinnae trust a Campbell. PAUL MCLEAN of Perth, originally Connel.